The Tumulus of Bougon (known also as the Necropolis of Bougon) is a group of barrows dating to the Neolithic period. This site is located in Bougon, a commune in the Deux-Sèvres department of the Nouvelle-Aquitaine region in the western part of France. The Tumulus of Bougon were constructed at various times during a period of over 1200 years from 4700 to 3500 BC. The site has been regarded as one of the oldest known examples of megalithic architecture on the Atlantic coast of France. The tumulus cemetery was re-discovered by archaeologists during the 19 th century, and was excavated over the years. 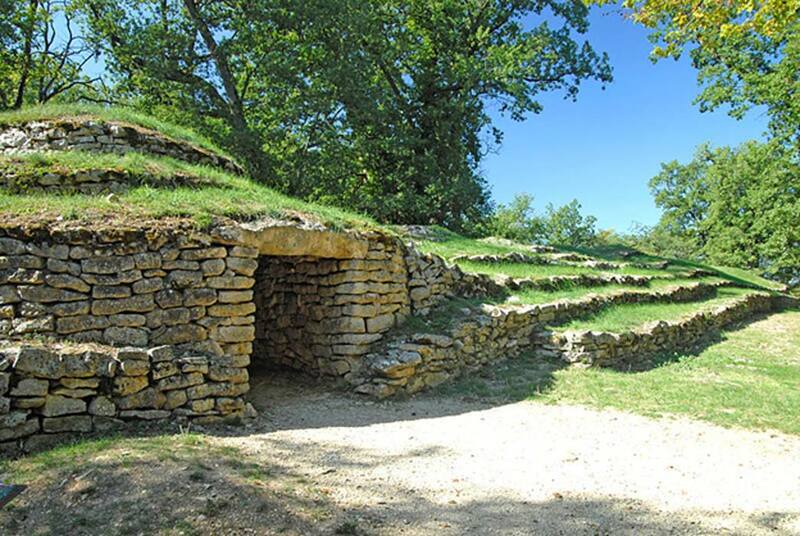 Today, the Tumulus of Bourgon is open to the public, and a museum, which displays, amongst other things, the archaeological finds from the site, is located less than a kilometer from it. The Tumulus of Bougon consists of five separate barrows that were built between the 5 th and 4 th millennia BC. One of the interesting features of this site is that all the barrows are different from one another, and showcase a unique architectural style. Tumulus A, for example, was the first to be discovered, in 1840. This tumulus is a stepped mound with a large rectangular chamber at its centre. During the excavation of this tumulus, a total of 220 skeletons, as well as grave goods, were unearthed. Tumulus A is also notable for its massive 90 tonne megalith as its capstone. Whilst Tumulus A was the first to be discovered, it was not the first to be built. It has been determined that the oldest barrow at the site is Tumulus E. According to archaeologists, this barrow was constructed around the beginning of the 5 th millennium BC. Unlike Tumulus A, this barrow has two inner chambers. It has been pointed out that originally, these chambers had their own circular mounds. Over time, however, the mounds merged, thus forming one single tumulus. Evidence of human burial was discovered during the excavations. Other barrows at the site also contain multiple chambers. Tumulus B is particularly interesting as it has a total of four chambers in it. This barrow, which was built during the 5 th millennium BC, is a long mound, similar to Tumulus E. The two chambers on the barrow’s eastern side, which were discovered in 1978, are cists, and do not have any access passages. On the other hand, the western side of Tumulus B contains two large rectangular chambers that may be accessed via passageways in the south. Like the other two tumuli mentioned before, this barrow also contained human burials. Tumulus C is a one of the more complex mounds at the site, as it was built in several phases. The current barrow was built over two earlier structures, a smaller circular mound and a rectangular platform next to it. Another unusual barrow is Tumulus F, which is the longest of the five tumuli. At each end of this barrow is a chamber, each of which was built at different points of time during the 4 th millennium BC. One of these barrows is covered by a 32-tonne megalith. In between these chambers is a series of structures that were constructed to stabilise the tumulus. One of the interesting things about the Tumulus of Bourgon is the way its builders obtained and brought the building materials, especially the huge megaliths, to the site. In 1979, an experiment was carried out by archaeologists to see how this might be possible. Using a technique employed the Neolithic builders, i.e. splitting the rock with moistened and bevelled wedges of wood, the archaeologists were able to extract a 32-tonne megalith from a quarry. As for the transportation of the megalith, the archaeologists had it placed on rollers that were in turn placed on rails. With 200 volunteers pulling the megalith, the massive piece of stone was moved several tens of meters in a morning. This showed that with enough manpower, the builders of the Tumulus of Bougon would have been able to extract and transport stone from a quarry to the site. Today, the Tumulus of Bougon is open to the public, and a museum has been established not far from the site. Interestingly, the museum was constructed around an old Cistercian priory. The highlights of the museum include an exhibit showcasing artifacts discovered from the Tumulus of Bougon, a reconstruction of the Gavrinis passage tomb (a famous megalithic site in Brittany), and artifacts from the dolmens of Puyraveau, a megalithic site not far from Bougon. Read more about A Return to Ancient Burial Traditions: Want to Be Buried in a Barrow?